The legal speed limit within the Main Campus is 30 kilometres per hour, while the speed limit in car parks/lots is 10 kilometres per hour. Driving any vehicle in excess of these speed limits is prohibited. University and State traffic regulations, rules and signs govern the use of motor vehicles on campus and must be observed at all times. All authorized persons driving into the campus, i.e., persons who have valid Parking Permits visibly displayed on the windscreen or dashboard of their vehicles, will be permitted to enter the campus through the North Gate and South Gate entrances. All persons seeking entry to the campus without a valid Parking Permit visibly displayed on the windscreen or dashboard of their vehicles, must do so via the Visitors' Gate entrance only. Such persons will be subject to an interview by security personnel, to whom they must declare the nature of their business on campus. Only upon verification of their purpose for seeking entry to the campus, and authorization security personnel that they may do so, will such persons be allowed to proceed into the campus. All motorists on campus are reminded that they must observe the speed limit on campus, as well as all parking regulations, pedestrian crossings and other road markings and signage. 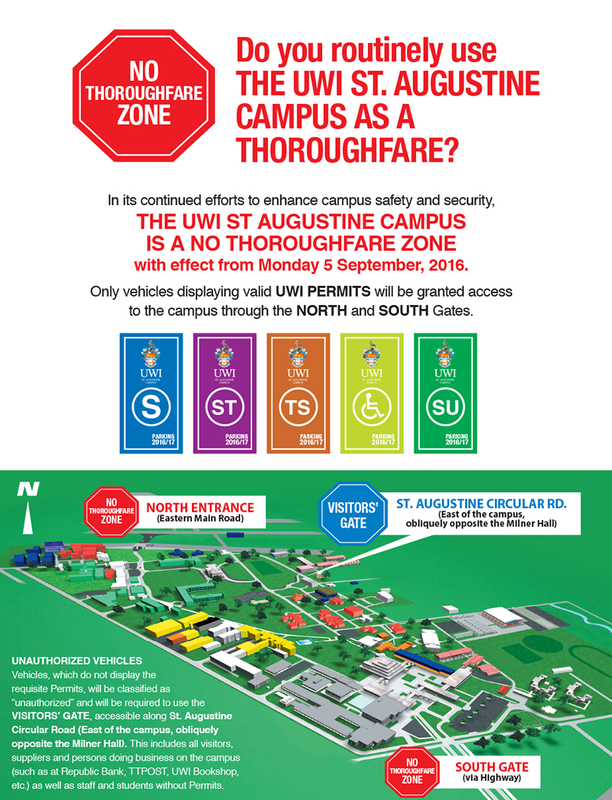 Full detailes are outlined in The UWI St. Augustine Parking and Traffic system Rules and Regulations. Motorists must give right-of-way to pedestrians crossing at designated marked crosswalks. Unnecessary noise from horns and mufflers or any other device is prohibited at all times. Driving or parking on grass, paths or sidewalks is prohibited except in those instances where sidewalks are designated for the use of bicycles. Making a U-turn on the Main Campus is prohibited (except where designated, for e.g. at a cul-de-sac). Operating a motor vehicle against authorized signs indicating the direction in which traffic should flow is prohibited. Failure to observe a stop sign while operating a motor vehicle is prohibited. Failure to yield right-of-way while operating a motor vehicle is prohibited. Operating a motor vehicle from one lane of traffic to another without first ascertaining if such movement can be made with safety is prohibited. Playing loud music in a vehicle is prohibited at all times. Traffic laws and regulations are in effect 24 hours a day unless stated otherwise. All Traffic Rules and Regulations are strictly enforced and breaches may result in the vehicle being clamped and released on payment of a fee of one hundred dollars ($100.00). Notice that such a device has been placed on the vehicle is posted in a prominent location on the window or the windshield of the vehicle where the operator of the vehicle would reasonably be expected to observe it. The notice to be posted on the vehicle shall state the place and/or means by which the vehicle’s release may be secured. The immobilizing device used to impound vehicles is the property of The University of The West Indies and any damage to it shall make the offender liable for the damage to the University’s property. Removing the device or tampering with the device, except by the UWI Estate Police, constitutes a separate and additional offence. Vehicle not in motion disobeying traffic signs or markings. Parking without a valid Parking Permit. Parking in a “No Parking” or reserved area. Unauthorized parking in Handicapped person’s bay. Parking not wholly within a parking bay. Parking so as to cause interference or obstruction. Unauthorized parking of a motorcycle or bicycle. Unauthorized parking on grassy areas. Parking other than in a parking area. Persons whose vehicles have been clamped shall have the right to an appeal hearing before an impartial Officer (Campus Registrar) or committee appointed by the Campus Registrar provided a timely request is made thereto. The purpose of the appeal is to determine if there was good cause for the clamping of the vehicle. No hearing is held unless requested in writing by the owner or operator of the vehicle or his/her agent to the Campus Registrar. The hearing shall be held within seventy-two (72) hours from receipt of the said request. In lieu of the appeal hearing, or pending such hearing, or if good cause is found at such hearing, the owner of the vehicle or the operator of the vehicle or his/her agent may obtain release of the vehicle by paying the clamp fee of $100.00. If good cause is not found at such a hearing and the vehicle was previously unclamped upon payment of the $100.00, such payment shall be refunded. A valid parking permit is required to park on the University's compound. Parking permits are valid only until the expiration date displayed on them. Possession of a Parking Permit does not guarantee the availability of a parking space. Parking permits are for the sole use of the persons to whom, and the vehicles for which, they are issued and are not transferable. Any attempt to transfer, loan or sell a parking permit shall result in revocation of the permit. Parking is permitted only in areas designated as legal parking spaces (by white stall lines on both sides of the vehicle). Handicapped spaces marked with blue and white handicapped signs are painted to designate the space for handicapped use and are reserved exclusively for vehicles displaying The University of the West Indies Handicapped Permit. The responsibility for finding a legal space rests with the motor vehicle operator. Inability to locate a convenient spot is not an excuse for violating University parking regulations. When signs or markings indicate a particular angle of parking, no vehicle should be parked at any alternate angle or occupy more than the space indicated within the lines for one vehicle. The campus speed limit is 30 kilometres per hour. The speed limit inside car parks/lots is 10 kilometres per hour. The permit holder is responsible for having a valid driver’s permit and vehicle insurance as required by law. A vehicle will be considered in violation of University regulations if it is stopped or standing in a no parking area or restricted zone. Persons driving a replacement vehicle on campus, for which they do not have a valid Parking Permit, are required to park at the visitors Car Parks, i.e., TGR North or TGR South Car Parks. Areas not specifically designated for parking will be considered “No Parking” zones. Security officers are authorized to clamp or tow vehicles, at the owner’s expense, that are in violation of the University's parking regulations. Clamped vehicles will be released by the Campus Security Services Department upon payment of a fee of one hundred dollars ($100.00) to the Cashier at the Campus Bursary during business hours or to the Campus Security Services Department after business hours. Towed vehicles will be released by the Campus Security Services Department upon receipt of the claim check, which can be obtained from the Office of the Director of Security upon payment of the assessed fee and charges. University Traffic rules, regulations and enforcement are in effect all year, including periods when classes are not in session. Students, visitors and guests of the University are permitted to park in the car parks on the Main Campus (with Parking Permits where applicable) on weekends and public holidays and between the hours of 6:00 p.m. and 6:00 a.m. on weekdays. Also, limited parking at the Heart Ease and JFK East Car Parks is provided for students on a first come, first serve basis between the hours of 6:00 a.m. and 6:00 p.m. on weekdays.